What would you do if you went to a cash machine to get £20 and got the below two bank notes? This is what I got when I used a cash machines in London recently. 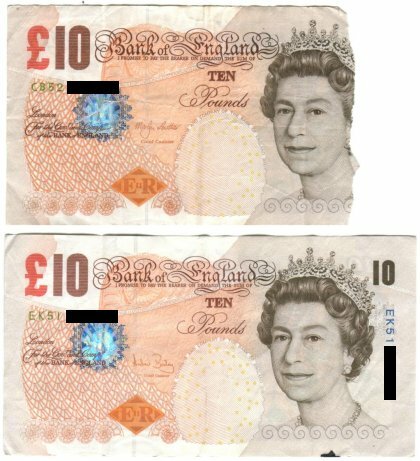 One of the £10 notes is fine, the other is only about 3/4 complete. This obviously isn’t good as no shop will accept a note like this (unless they don’t spot it). You won’t be able to use it in a machine – they check that you feed them a complete note. The easiest option is to take the note to the bank whose cash machine it is and ask for a replacement. As it is their fault you have a dud note they should give you a replacement – unless they feel like being awkward. If is very hard to prove that this bank note came from their machine so if they feel like being awkward there’s not much you can do. Failing that you could take the bank note into another bank and ask for a replacement. Just be polite and hopefully you’ll get what you want. Your chance of success probably depends on how complete the note is. If the note has both serial numbers, the silver thread, and is over half complete then you’ll probably be ok. If you have less than half a note then you won’t get anything – if it was possible to get a full £10 from just half a £10 then everyone would be ripping their banknotes in half to double their money! If you really can’t get any luck from your bank or another bank then you can send your note to the Bank of England. You can fill in a Mutilated Notes claim form and post your note to them. Of course there is a risk that it will get lost / stolen in the post, and it will cost you an envelope, a stamp and some time, but if you have exhausted all other options then give this a go. The currently replace about £40 million worth of bank notes each year. I had to wait until the weekend before I was able to visit my local NatWest branch but when I did they exchanged the incomplete banknote for a complete one with no fuss. I just told them that one of their cash machine had given me a £10 note with a bit missing from the end, and asked them to swap it for a complete one. This entry was posted on Monday, February 15th, 2010 at 9:39 pm and is filed under Life. You can follow any responses to this entry through the RSS 2.0 feed. You can leave a response, or trackback from your own site. In the states you need only 51% of a bill for it to be valid and accepted. Are you certain it’s not the same by you? I once microwaved my wallet when I was 16 hoping to dry it out after it got soaked and burnt all of the cash in half. This happened to me on Sat 30 June 2012. £20.00 had 1/3 missing, so only one serial number showing. RBS ATM at North Wembly. RBS would not help and said take it too the Bank of England(Which you can’t do, you have to post it off after filling in a form from the Bank of England website). THANKS RBS, I wonder why we hate the banks and bankers.